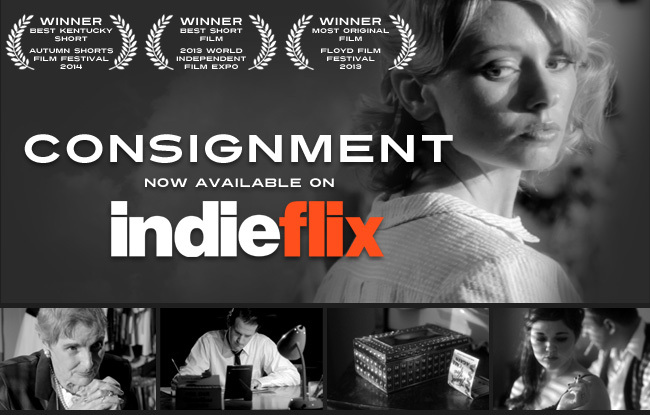 "Consignment" picked up for distribution by INDIEFLIX! On the heels of an amazing festival run, Justin Hannah's award-winning short film "Consignment" has been picked up for distribution by IndieFlix, an independent film distribution and online screening agency based in Seattle, Washington (watch it here). Described as "the Netflix of independent film" by Variety, IndieFlix seeks out the best independent films from around the world and makes them available to thousands of subscribers via PC, TV, Roku, tablet or smartphone. Justin Hannah, the writer/director of "Consignment" and an IndieFlix member, said, "This is incredible news. I've always been impressed by the quality of independent films available on IndieFlix, and to be featured among them is a dream come true. IndieFlix offers a huge opportunity for 'Consignment' to be seen by literally thousands of film lovers. I'm absolutely thrilled to be part of their collection." An IndieFlix subscription costs $5 a month, and includes unlimited access to IndieFlix's vast library of award-winning independent shorts, features, documentaries, and web series. The price drops to just $4.17 per month when purchased annually (at $50 per year). When you become a subscriber, you'll also be supporting independent film, because a portion of the proceeds go directly to IndieFlix filmmakers. In fact, every minute of a film you watch on IndieFlix directly profits the filmmaker who created it. As a special incentive to "Consignment" viewers, IndieFlix is offering both a free 1-month trial of IndieFlix, and $15 (30%) off an annual IndieFlix subscription. Just follow the links to take advantage of either offer. "Consignment" is also available via Vimeo On Demand and IndieReign.